Urban waterways are waterways and water bodies in the urban environment including natural features and those constructed as part of a drainage system. Urban waterways can include wetlands, lakes, rivers and estuaries; open unlined drainage channels; closed pipes and concrete drains; compensating basins and sumps; and water sensitive urban design structures such as rain gardens and swales. Traditional urban drainage systems were designed to reduce local flooding by channelling stormwater quickly to rivers, wetlands, oceans or basins. However, this often has negative environmental and social impacts linked to pollution, such as algal blooms that can harm wildlife and prevent recreational use of water bodies. The Department of Water focuses on improving stormwater management by achieving multiple outcomes, including improved water quality management, protected ecosystems, and liveable and attractive communities. The Department of Water promotes Water Sensitive Urban Design which includes more effectively incorporating water cycle management in the urban environment such that environmental and social values are enhanced. To access detailed information about management of stormwater and urban waterways see the Stormwater management manual for WesternAustralia. For more information on the Department of Water's role in managing urban waterways see Urban development. A living stream is a constructed or retrofitted waterway that mimics the characteristics of a natural stream. It may be a narrow stream which runs only in winter, a permanent stream, or a large river. Whatever its size, a living stream has characteristics that distinguish it from a simple drain. 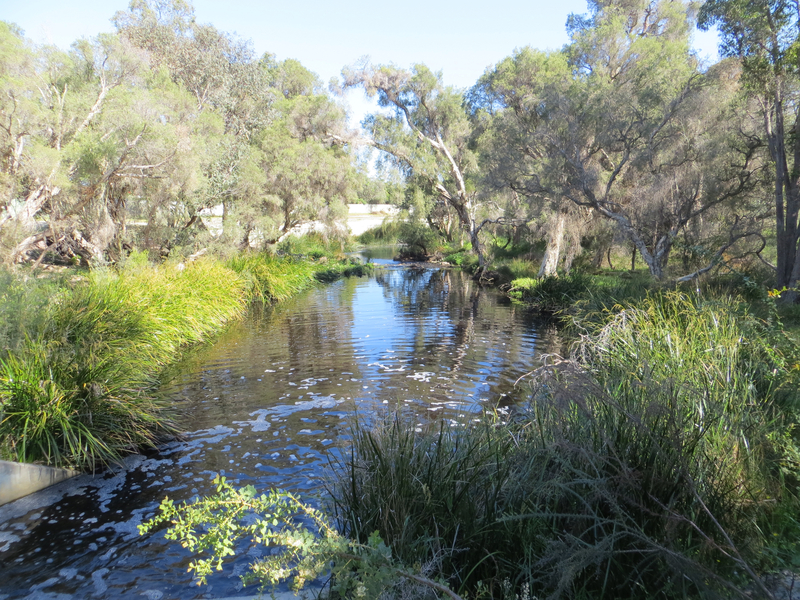 It has stable banks with riparian and aquatic vegetation, that provide habitats for native animals such as macroinvertebrates, fish and crayfish, frogs and waterbirds. It can also provide a beautiful feature of the landscape for people to enjoy. In the past many natural streams were converted to open drains and carried polluted water, and sediment to our receiving water bodies such as the Swan Estuary. They were often ugly and hazardous with steep banks, which meant they had to be fenced from public access. However, in recent years, due to recognition of the beneficial effect that streams have on water quality and the urban landscape, many drains have been restored to become living streams. Erosion control - The riparian and aquatic vegetation, riffles, and meandering shape create "roughness" which slows the water, thereby reducing its capacity to erode and transport sediment. Water quality improvement - Aquatic vegetation and natural biological processes help to oxygenate the water, remove nutrients and non-nutrient contaminants and thus improve water quality. Habitat - A living stream provides a diverse range of aquatic habitat for a plants and animals. It also provides a corridor of land and water along which many animals can move. Education – Living streams provide education opportunity for local schools, TAFE colleges and Universities. They provide opportunities to research the behaviour of the plants and animals which live side by side with humans. Recreation - Streams, rivers and estuaries provide refuges for people as well as wildlife. They provide a range of recreational opportunities, including canoeing, fishing, bird watching, bush walking, and the simple exploration of nature. They can be shady green corridors through housing developments, providing places to relax and enjoy. The Department of Water has been involved with improvement of several urban drains under the Urban Waterway Renewal Program – for information see the South East Regional Centre for Urban Landcare website.